These decorative air return covers have a steel core construction to ensure the products strength. Our brass air vents are plated in their colorful finish and provide your space with some personality. When you need a decorative air return cover order this supply vent for continuous airflow. Our brass air vents are plated in their finish and have a 7/8" depth on each side of the faceplate. This air return cover is the perfect vent to fit between your walls molding! The brass air vents are made with fins angled at 20 degrees and are space 1/3" apart to ensure proper flow of your spaces air. Installation on these brass air return covers is simple; simply screw the vent into place in your wall. Our brass air vent has two pre-drilled screw holes on either side and the screws are included with the purchase. Tip: To order these brass air vents, it is necessary to measure your existing hole opening on the wall and not an existing grill. The 30 x 8 air return cover will fit over a hole measured at 30 x 8 inches; the overall faceplate dimension will be 1 1/4 inches larger. Our brass air vents are just one of the three other finishes we offer. We have metal air return covers finished in white and pewter, as well as a plastic option! 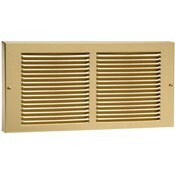 Try out this brass air vent cover in your space and notice how the air return covers brighten up your decor!